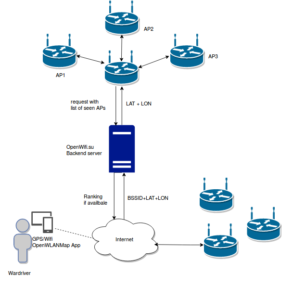 OpenWifi.su is working on wifi positioning system. It uses an android app called OpenWLANMap App as the wardriving tool to collect wifi access points and sends it with the geolocation of the phone to the backend. The backend stores the data in database and also offers an API for non-GPS devices to request their positions based on the surrounding wifis.The backend currently uses triangulation technique on the numbers of access points it receives from the request device to calculate it’s geolocation. A data entry from the wardriving app is currently BSSID + LATITUDE + LONGITUDE, which is stored temporarily effectively in local disk with 28 bytes (12 bytes for 12 characters of the MAC Address, 8 bytes for each latitude and longitude) before being uploaded to backend. The wardriver can do it manual or automatically. The app respects _nomap Wifi APs and does filter out some mobile hotspots on public transportation in europe. Unfortunately the app is hardly out of date. There are no developers working on the app and no updates for years. It does not run in new android devices. The OpenWifi.su has an amazing community of wardriver, over four thousands people. They have to keep very old phones to be able to run the app. But this community began to shrink in fact because peoples buy new phones which are not able to run the old app anymore. Wifiscan is a service of scanning wifi access points. All the data of the AP such as BSSID, SSID, RSSI, frequency, channel , encrypted method, scan timestamp etc. will be scanned and display as user’s option. Necessary data will then be stored temporally local and later on uploaded to the database. The service will be stopped if the GPS of the device isn’t changed after n seconds in order to save device’s battery. Wififilter helps filter out: _nomap, mobile hotspot ( Call for help to collect mobile hotspot from different countries), ad_hoc network (I am working on it), collect open wifi to automatic connect and upload data if possible. Stay tuned, I will update it soon. "I know OpenWRT and like them. We simply couldn’t accept everyone. You folks made our short list if that helps. I can give you more feedback if you send me the URL for your ideas list. Is there a way Google can help you beyond Summer of Code? Leslie Hawthorn"
We had some nice ideas. Our intention was to serve as an umbrella for all the freifunk projects here, but maybe we can join the program next year. We still have the ideas pages, which is probably also intresting for developers who want to join freifunk projects in the future. Some fantastic work was done during the last days working with some great folks to get an application for freifunk networks for the Google Summer of Code out. Our goal is to get new students excited about the idea of free networks and to join us in the development process and contribute code. We have formed an international group to get this application done. Besides talking to our developers in Germany I have been busily speaking to ninux.org from Italy, guifi.net from Spain and France Wireless in order to recruit our most talented and active developers as mentors for the programme. Not everyone was able to give me a "yes" yet, but we have formed a great team to start off and we are happy to welcome even more prospective mentors from other free wireless networks from around the world. My idea is that we would have mentors for students who would maybe even be able to meet them locally. As we find already more than 170 free wireless communities worldwide on the global freifunk newswire, there is a chance we could do this in a lot of cases. networks all over the world.